Ford Racing's Brembo Front Brake Kit for the Mustang GT will improve your stopping power and add some style. Boosting your stopping power is just as important as boosting your engine power. 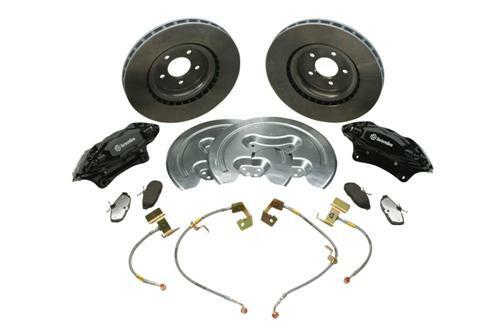 Get that boost from Ford Racing's Front Brake Kit, now offered at ModBargains.com. This Brake Kit comes with all necessary parts to install two front brakes, that are up to GT500 spec. The Brembo calipers have 4 pistons, are 14" in size, and are gloss black with a white Brembo logo. *Note: 18" wheels are REQUIRED in order for this brake kit to clear. If you don't have 18" wheels, let our guys know, and we can help you out there as well. Call ModBargains.com at 714-582-3330 or Order Online to get your Ford Racing Brembo Brake Kit Today!